Scientists in the USA have developed a new deep brain stimulation method to treat the symptoms of Parkinson's disease. While present deep brain stimulation for Parkinson's is constant, the new method is 'adaptive'. This means the stimulation changes in real time, based on the patient's neural signals. The study, published today in the Journal of Neural Engineering, used brief in-clinic testing to prove the feasibility of the idea. Deep brain stimulation (DBS) can be an effective treatment for Parkinson's disease (PD). But it has limitations that reduce effectiveness for individual patients, and prevents a more widespread use of the technique. For example, trained clinicians must programme the implants. It can also be time consuming and, for some patients, satisfactory settings are never achieved. The senior author is Dr. Philip Starr, Professor of Neurological Surgery at the University of California, San Francisco. He said: "This is the first demonstration of adaptive DBS in PD using a fully implanted device and neural sensing. "Our approach uses an algorithm to measure the patient's neural feedback from the brain surface and change the stimulation in real time. This way, we avoid the stimulation being too intense when it is not needed, which can cause adverse effects such as involuntary movement, known as dyskinesia." 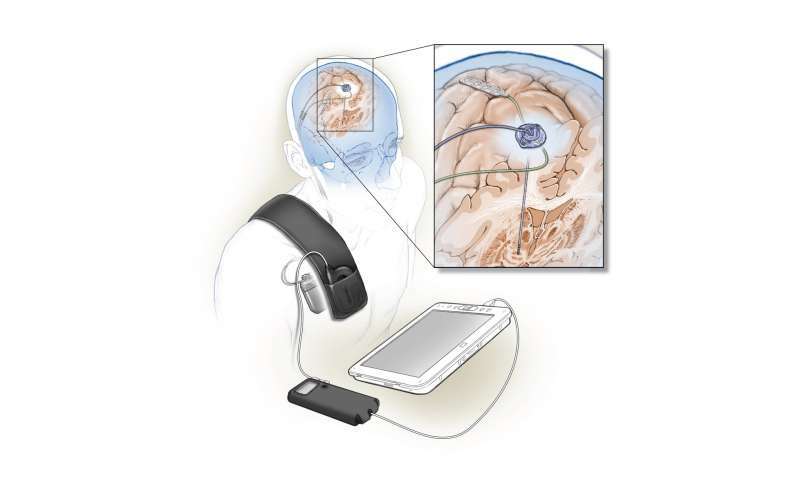 To test their device, the researchers trialled it in two patients with PD. They used a fully implanted neural prosthesis enabled to use brain sensing to control stimulation amplitude. Co-author Professor Howard Chizeck, from the University of Washington, said: "The device works by using a cortical narrowband gamma (60-90 Hz) oscillation related to dyskinesia to decrease stimulation voltage when gamma oscillatory activity is high (indicating dyskinesia) and increase stimulation voltage when it is low." First author Dr. Nicole Swann, now at the University of Oregon, said: "There are several reasons why adaptive DBS could improve this therapy. Reducing the stimulation current without losing the therapeutic benefit could reduce stimulation-induced adverse effects. It could also extend battery life, or allow the relatively large pulse generators we currently use to be made smaller. "Additionally, some of the PD patients most in need of DBS are also among the most difficult to successfully program: those who alternate between extreme states of dyskinesia and bradykinesia with little in-between time. Adaptive DBS could be very effective for them." Professor Starr added: "This study is a demonstration of the feasibility of adaptive DBS. Now, further work is needed with a larger-scale trial."